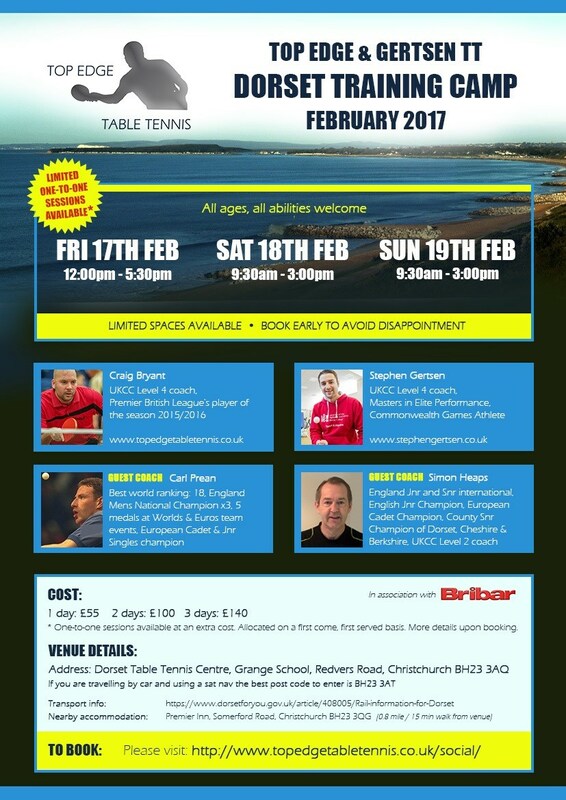 Craig Bryant and I, are running a training camp at the Dorset Table Tennis Centre on the 17th, 18th and 19th of February 2017. Both Craig and I are UKCC Level 4 coaches, have competed at Commonwealth level and have around 25 years of coaching experience between us. We have 2 guest coaches working with us at the training camp, table tennis legend Carl Prean and local coach and multiball superstar Simon Heaps. Carl is the former World number 18, 3 times National Champion and the conqueror of table tennis great, Jan-Ove Waldner, 11 times!!! Simon is a former Cadet European Champion and a former junior and senior international, Simon is also a UKCC level 2 coach and is very skilled at multiball. We had a fantastic response from our first camp, which was held in Horsham at the beginning of November and we filled the camp very quickly. Places are limited once again, so if you or someone you know could be interested in the camp, please get a completed booking form back to us as soon as possible. Details of the camp and the booking form are attached at the bottom of this email. We're offering a £10 Christmas discount (£130 total) for those that book for all 3 days and pay before Christmas day. We're already looking forward to, what is looking to be, an even bigger and better camp. If you have any questions at all, please feel free to get in touch.